LIMA, Peru (CNS) — When Pope Francis visits Colombia in September, he will take his message of mercy and reconciliation to Cartagena, a city that still bears scars of its painful history as a slave port. And he will walk the streets where another Jesuit, St. Peter Claver, put that message into practice four centuries ago. By the time the young Peter Claver arrived in Cartagena from Spain in 1610, the slave trade was already booming. More than 78,000 African slaves arrived between 1570 and 1640 — some 10,000 a year. By some accounts, slaves made up half the population of Cartagena at the time. 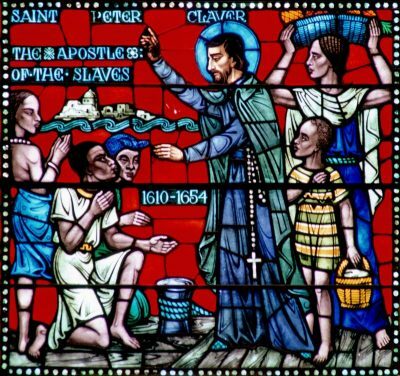 Pope Francis’ visit to the place where St. Peter Claver lived, worked and finally died in 1654, after suffering the same diseases that afflicted the people to whom he ministered, will be a reminder that human rights are crucial for the country’s peace process after decades of civil war. Fraser covers Latin American issues for Catholic News Service and will travel to Colombia for the pope’s visit.